As I continued to mourn the loss of our New York farm vegetables, I was left to think of creative alternatives for this week. Today, I went to the best place I know to get farm fresh New Jersey produce: New York City! I stumbled upon some great corn and heirloom tomatoes from the Garden State at the market this afternoon and was eager to incorporate them into dinner. 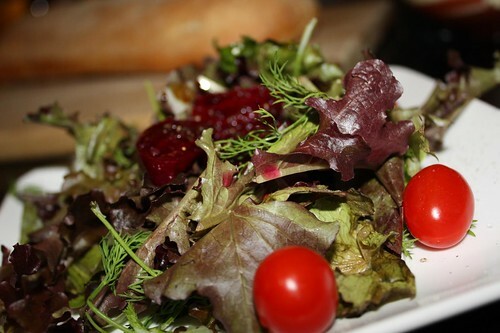 First, I made use of some of the remaining farm beets with this herbed salad mix with a little Balsamic vinegar, some olive oil, and grape tomatoes. 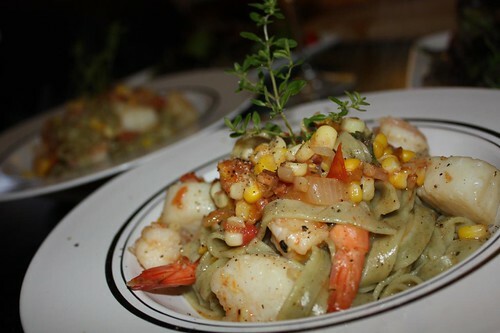 For the main course: spinach fettuccine with New Jersey corn, heirloom tomatoes, garlic, bacon, shallots, white wine, butter, olive oil, lemon thyme (from my mother's herb garden), shrimp, and scallops. I think I might be focusing a little too much on pasta lately. Partly it's because our I haven't been buying a lot of proteins lately. Mostly it's because I love pasta. Now begins the part where I press my luck and make pasta continuously until Jen becomes wary of eating it. I can't help it, it's just my Italian heritage. You should fight the good fight. The day may come when the courage of men fails, and they stop eating pasta. But Today! Is! Not! That! Day!